Animal chiropractic, also known as Veterinary Spinal Manipulative Therapy (VSMT), is the treatment of Segmental Dysfunction (SDF) or Vertebral Subluxation Complexes (VSC). In more simple terms, it is a hands-on method of modulating the nervous system in order to restore balance to the body. SDF/VSC refers to neurologic and biomechanical processes that cause imbalances in communication and coordination throughout the entire body (not to a partial dislocation of bones in relation to each other as the term “subluxation” might be defined in traditional medical terminology). Therefore, areas of the body are not treated in isolation, but in relation to one another. Treatment generally involves using very specific adjustments in contact with vertebrae or other bones, but may also include soft tissue manipulation, to affect specific joints and receptors. The goal of these therapies is to stimulate neurologic receptors in order to improve function in the neural pathways all the way to the brain, with the goal of alleviating any pain and restoring normal motion. The nervous system consists of the central and peripheral portions. Centrally, there is the brain, or control center, and the spinal cord, which is the communication pathway and reflex coordinator. Peripherally, the somatic portion controls skeletal muscles, and the autonomic portion regulates glands, blood vessels, and internal organs via the sympathetic (fight-or-flight) and parasympathetic (conservation of energy) branches. Optimal neurologic function is necessary for health and healing. Almost any animal will benefit from chiropractic treatment, but consulting a knowledgeable practitioner can help someone decide if it is the best course of action for the given condition based on the current symptoms and goals. One of the main things that can occur as part of SDF/VSC is obstruction of normal blood flow preventing nutrients and oxygen entering the tissue, as well as hindering removal of waste products, thereby resulting in pain, inflammation, and delayed healing. Painful trigger points can also develop in muscle, along with regional swelling and small hemorrhages. Over time, normal tissue is replaced with nonfunctional scar tissue, muscle atrophy occurs due to inactivity or abnormal neurologic stimulation, and tissue rigidity and adhesions can develop in joint capsules, ligaments, tendons, and muscles. Multiple treatments are often necessary to relieve pain and restore neurologic function, resulting in more normal motion, although some improvement is expected after the first session. Maintenance treatment is generally recommended to sustain results. The chiropractic practitioner may also suggest exercises and nutritional changes in order to prepare the body for the chiropractic adjustment or to help sustain the benefit of the treatment. 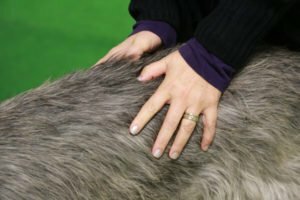 It may be beneficial to have a few key things to watch for to determine if a pet would benefit from visiting an animal chiropractic specialist. Often, it is reasonable to have a baseline evaluation done for a young pet, to allow for ideal development of their neurologic system. 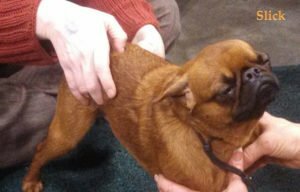 Animals of any age or ability with roaching or hunching of the spine should be evaluated, as well as any animal that has undergone anesthesia or sedation for surgery, dental cleaning, or other procedures. Under sedation, animals may remain in a specific position without moving for longer than they would normally choose or their bodies might move in ways they can’t protest, despite every precaution taken by the veterinary care team. Chiropractic care can help restore normal motion and prevent ongoing problems. Athletic animals will be more able to perform at an optimal level, and be less prone to major injury, with a well-balanced neurologic system. Any changes in ability or function should be a trigger to have the pet evaluated. Back pain, including suspicion for disc herniation, are commonly treated symptoms. Senior pets may also develop arthritis, general weakness, incoordination, and organ dysfunction that can respond to chiropractic treatment. Qualified chiropractic practitioners are either veterinary or chiropractic doctors who have taken additional training through chiropractic or spinal manipulative therapy programs, available through the Healing Oasis Wellness Center, American Veterinary Chiropractic Association, International Veterinary Chiropractic Association, and the College of Animal Chiropractors. Training involves over 200 hours of education, in addition to written and practical examinations. Additional continuing education is required to maintain certification. The doctors of Chiropractic for EveryBody consistently exceed the required hours in the pursuit of knowledge that will be of benefit to their patients.